Kleefeld on Comics: Where Have All The Webcomics Gone? 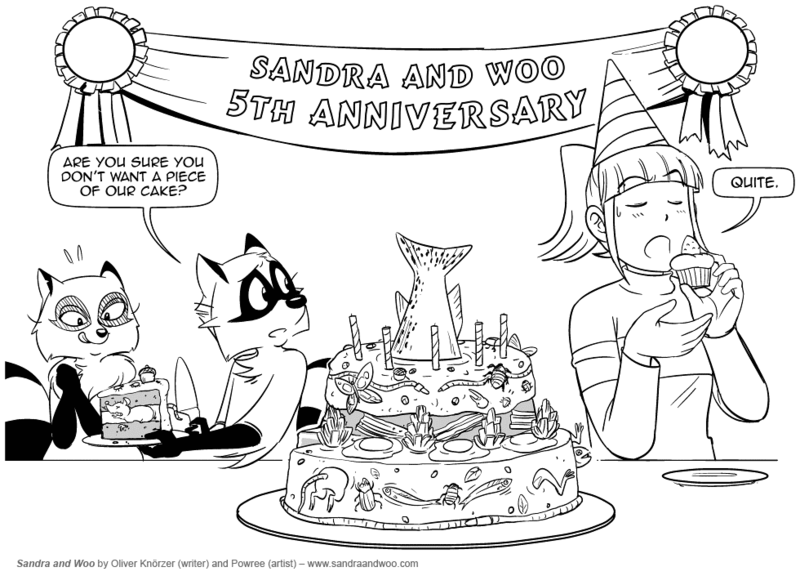 Oliver Knörzer pointed out to me last week that his webcomic, Sandra and Woo, was coming up on its fifth anniversary. I found myself a little too busy to write something up in advance, but congrats to him and artist Powree! This past Saturday, they celebrated with some mouse cake, and Knörzer posted some reflections on the past half decade. He makes some interesting observations that I wanted to call out here. First, he runs through a list of 31 other webcomics that, along with S&W, were nominated for a "Best New Webcomic of 2008" award from the Webcomic Beacon Webcast. Now, the award itself doesn't carry the weight of, say, an Eisner nor does it provide a fair sampling of all the webcomics that debuted that year. It does, however, provide an interesting snapshot. Theoretically, if you're putting out a webcomic that someone catgeorizes in a "Best of" type of list like this, you've at least implied that you're putting a great deal of time and effort into your work, that you have a passion for creating comics, and that this is something you really want to do. People aren't going to consider you for an award if they get the impression that you're going to bail on the webcomic next week. And yet, of those 31 other webcomics, Knörzer points out that not even a third of them are still updated with any regularity. A quarter of them are offline entirely. I think that speaks volumes to those folks who are able to stick things out that long. Regardless of the level of quality, that says a great deal about their passion and determination with their respective projects. 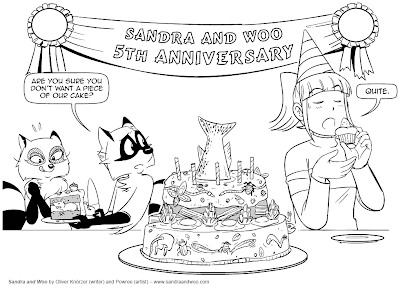 In many respects five years, doesn't seem that long, but in webcomics, that's really an eternity! Knörzer also makes note of some difficult times he had in his personal life during at least some of that period, adding that, "Sandra and Woo was one of the few things that gave my daily life at least some structure from fall 2008 onwards." I find it interesting in that I've seen more than a few creators now who've admitted to creating webcomics as a coping mechanism for their life's stressors. I seem to even recall hearing a story a year or so back about veterans with PTSD being taught how to make comics specifically to help them work through some of their issues. It's certainly not a catch-all answer to all of your problems, but I suspect making comics in particular (compared to other forms of art) helps because it provides the creator to focus on the narrative instead of discrete and isolated words/images and, in the case of webcomics, it also "forces" them to adhere to a production schedule which, as Knörzer alludes to, provides a stability in what can seem like a highly unstable world. I'd kind of like to throw the suggestions out there to everyone actually. If you're having issues and problems in your life -- whatever they might be -- producing a webcomic might help to resolve, or at least adapt to, them. The content doesn't even have to be about the issues themselves, but I think your subconscious will draw on those ideas and you'll be able to exploit them in some mutated form through your webcomic. Was Knörzer thinking that specifically when he first thought of Sandra & Woo? I doubt it. But he recognized its significance in hindsight. In any event, happy anniversary to Knörzer and Powree! May your next five years on S&W be as entertaining as the first!